Compression socks are used for a wide variety of reasons from medical conditions to sports related therapies. They are typically fitted to be tighter at the feet and gradually looser further up the legs. They are designed to create a comfortable pressure to help alleviate the symptoms of an assortment of conditions. 1. Varicose veins – Improper blood flow of the veins in the legs can cause painful aching and swelling. Varicose veins often appear as enlarged and bulging areas under the skin. 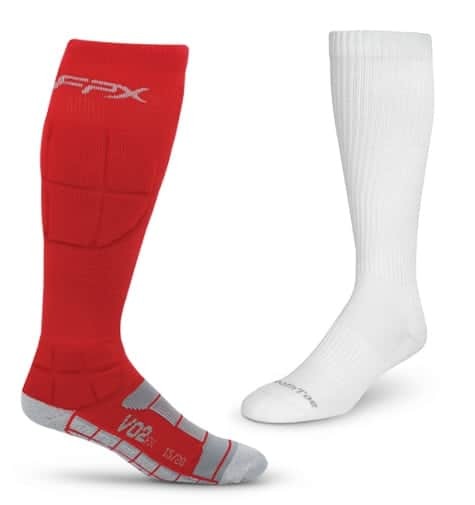 The use of compression socks can help create proper blood flow and reduce pain and swelling. 2. Edema – When fluid builds up in your ankles legs and feet, it can create painful swelling called edema. It can be caused by a variety of factors including diet, circulation issues and even high humidity levels. Compression socks help to increase the blood flow to the legs to reduce excess pooling of fluids. 3. Pregnancy – Swelling throughout the body is very common in pregnancy. The legs and feet often bear the brunt of this issue, although it can occur virtually anywhere. Compression socks help to increase blood flow and circulation and reduce the retention of fluids in the legs. It is important to seek medical attention if your swelling is severe, as this could be a sign of a much more serious condition. 4. Athletic injuries – Compression socks have been finding their way into the mainstream as a therapeutic aid for athletes who are dealing with a variety of leg related issues. Many runners have found that compression socks help with muscle related injuries such as shin splints. Increased blood flow to the legs can also improve performance and might even help reduce the recovery time after competitions. 5. Swelling during travel – Extended time in a seated position can decrease the blood flow to the legs and feet and create uncomfortable swelling. Conditions such as deep vein thrombosis can also be aggravated by long plane or car rides. Compression socks help to increase blood flow to help reduce swelling during travel and minimize the risk of blood clot formation. SmoothToe offers patients a wide range of compression socks to minimize the discomfort of leg and foot swelling. Choose from a variety of colors and styles including sports, dress, every day and medical grade options. Shop our diverse collection today!